Yesterday my TeenSonMark made a cute comment about it. And you know how you have to stop and take note when teenagers say something cute. “Yep, I sure do.” I answered back. Again with my sweaty eyes…..he’s a pretty cute kid. Isn’t that what we Mom’s do….ruin the day with practice talk? Now…on the subject of cooking something good. Cooking something good…that everyone in your family loves. That is a challenge, isn’t it! This is the second French Dip Sandwich recipe I have tried in the last couple of weeks. Last week I didn’t add enough liquid to the crock pot, and it turned out pretty dry. This week it turned out much better. Most of my kids thought they tasted great. Most of my kids?…..I’ll take it. 1. Heat up a large skillet. Add the olive oil to the pan. 2. Sprinkle your roast with salt and pepper and place it in the pan. Let it get nice and seared on each side. 3. Place the roast in your crock pot. Sprinkle the Onion Soup mix over the top. 4. Let your bullion cubes dissolve in the hot water and then pour it over the roast. 5. Put the lid on your crock and cook on high for 6-8 hours. Take the roast out and shred it up with a fork about 1 hour before you are ready to serve. 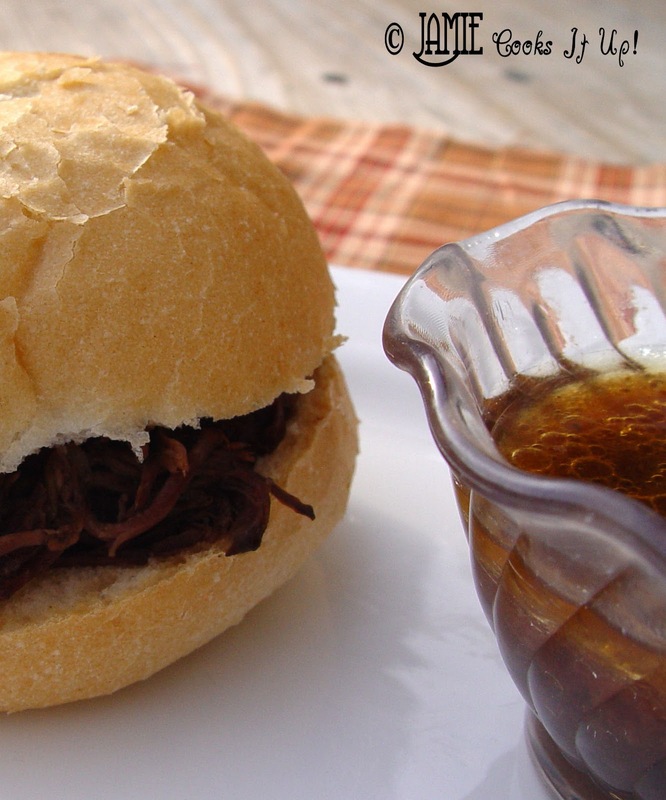 Put the shredded beef back in the crock and let it cook in all those yummy juices for the last hour. 6. Spread just a bit of softened butter on your rolls. Toast them on a griddle. Then add the meat and some cheese if you’d like. 7. Pour the hot juices left in the crock into small bowls for dipping. You have very lovely and delicious dishes! Compliments for everything! Looks delish! I've been craving French Dip for a couple of weeks now. Must make soon :-)! I found this recipe and used it for a massive double ward dinner. Compliments were abundant that night, which was a huge relief! So yummy!! Thanks for all the recipes. I don't know why the link isn't working properly. Just copy and paste it I suppose. How funny! 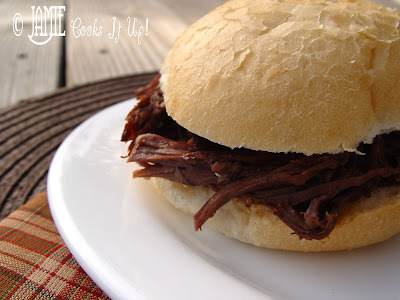 I just made beef dip sandwiches in the crock pot last night, before seeing your post! this will definitely go into the menu rotation! Thanks for letting me know you loved it. And I'm also thrilled to know you can start with a frozen roast! Woo Hoo! That is good news! Oh that looks yummy!!! I think I will have to try it this month. This looks delicious, my hubby would love this. I love when its starts to smell like winter too. Starting to get all my slow cooker recipes ready for all this chilly weather. Great, I just downloaded it to my phone. Guess I know what I’ll be doing while I’m nurnisg the baby!! And this stew looks so delicious and comforting. Perfect for the snowy weather we are having!! This was another hit with the family!!! LOVE your recipes, they always deliver very happy responses from my family at dinner time. This is my new go to site when I need/want something new that’s guaranteed to please. Thanks Jamie!! Such a great, easy recipe! We enjoyed it in our household last night for dinner – it will definitely be filed under the “To Make Again” category! Hi Jamie! I have all my ingredients to make this meal tonight! I have run out of time to do it in the crock! Is there a way I can do this recipe in the oven in a roaster? I need to know the oven temp and how many mins and anything else I should know. Thanks so much for sharing all your delicious recipes. I know I can’t go wrong when I make something you have posted. Thanks again! !